Besides gardening, writing is the other outlet of my self-expression.I like to capture my thought of the moment and lay it down in words.I hope that you find something interesting here to make you come back and visit again. Please do share your thoughts and make your visit known. Maraming salamat!!! Think a few times of human moralities and principles and that inner strength that we all suppose to have within us. Given, we all have stresses in life, of many different levels, that we each handle in different ways to the best of our abilities and ways of "coping". 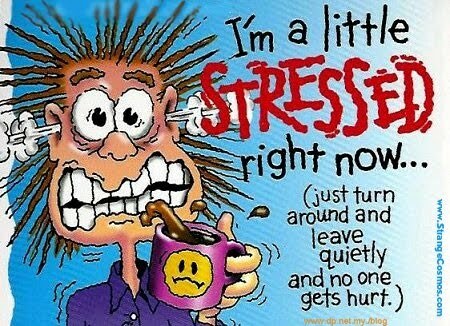 At some point in our stressful life, we somehow reach the point of "I had enough"... then what do we do? We do different things to try to balance out our lives when we reach that breaking point!!! My favorite Wikepedia says this about "breaking point" . In human psychology, the breaking point is a moment of stress in which a person breaks down or a situation becomes critical. A breaking point can lead to a shift in morals and world perception. It is that point at which physical, mental, or emotional strength gives way under stress and to which a condition or situation becomes critical. For some people, they resort in horrific act(s) in attempt to get rid of that one factor in the equation that tips off the scale of life and made it unbalanced. Do we, as the spectators give our understanding and justification of the horrific act that was committed when the mind was literally lost at that "breaking point"??? Do we give understanding to a mother that hurt her child because she "lost it"??? According to many internet sources,it was in 1858, when Anna Reeves Jarvis founded Mother's day in West Virginia in honor of her beloved mother. The rest of her life, Anna Jarvis fought what became of the day she created ... the commercial and political exploitation of it. It was not until June 1873 that the inaugural celebration of Mother's Day happened. As in any facet of life, motherhood has it own ups and downs. As a mother, my approach has been I do my best and think what is best of my child. I must say I have been lucky!!! TO ALL OF THE MOTHERS IN THE WORLD, a toast and a salute to you!!! It has been a long time since my last post. I apologized. I had been in pretty challenging period in my life that took quite a bit of my time and energy. Now I am in the recovery period and feeling pretty good. So here goes. Here is a concept for you to ponder upon. An older, wiser woman (the mother of a good friend of mine) from the Eastern world shared this with me as she listened to my woes. As I gnaw on the concept and reflect back on what have been happening in my life… I came to the conclusion that she could be right!!! She said: The wheel of life turns about every twelve years. When it turns, CHANGE(S) occur(s) in one’s life. The manifestation of the CHANGE(S) expand(s) to three years. In this turn of the wheel, one loses someone or something … job, wealth, partner and even one’s life. Be thankful she said if it’s not your life you lose because anything else is replaceable. The first of these three years is when gradual, little negative changes occur in your life. You are able to adapt to the “CHANGE(S). The second year is when you hit the bottom. This is when nothing works for you. It seems like everything and everybody is against you. You can not seem to correct these negativities for all your might. You might even wonder about your “faith”. This second year is the period of self realization … to submit or to fight … to the CHANGE(S). Life adjustments occur. The third year is the trip to recovery as slow as it might seem. This is when you start to feel that things are not as stressful or suffocating in your life as in that middle year. This is when things are looking up and those feelings that are positive are back within you again, and life is becoming “good” again… And so it continues for about twelve years … The turn of the wheel and the CHANGE(S), are what makes you that person that you are… What do you think? Agree? Disagree? Hhhhmmmmm … 2010 is my year!!! WELCOME and THANK YOU!!! This summer Zipper - my dog for about 16 years, went up to Rainbow Bridge. 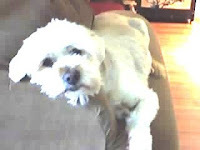 My other dog, Duke did not do well without Zipper. There was marked changes in his demeanor... I felt that he was missing his sissy... Zip. I decided that I would find him a sister or a brother from the city pound. Another Llasa Aphso mixed breed doggy caught my attention. He was charming as can be. He is 1 1/2 years and grayish/black in color. After a week-end of wait, Prince came home with me to meet his new brother, Duke. We found out that this little rascal has much too much of an energy, being a young un. He is into everything that his mouth and teeth can get hold into. And whatever that may be, rest assured it is torn into pieces. Now the backyard is Prince-proof!!! He sure has made Duke a very active brother by getting Duke to play, get into mischiefs, and be the partner in his "crimes"... Poor Duke!!! Zipper, Duke and Prince are doggies from the Llasa Aphso breed. 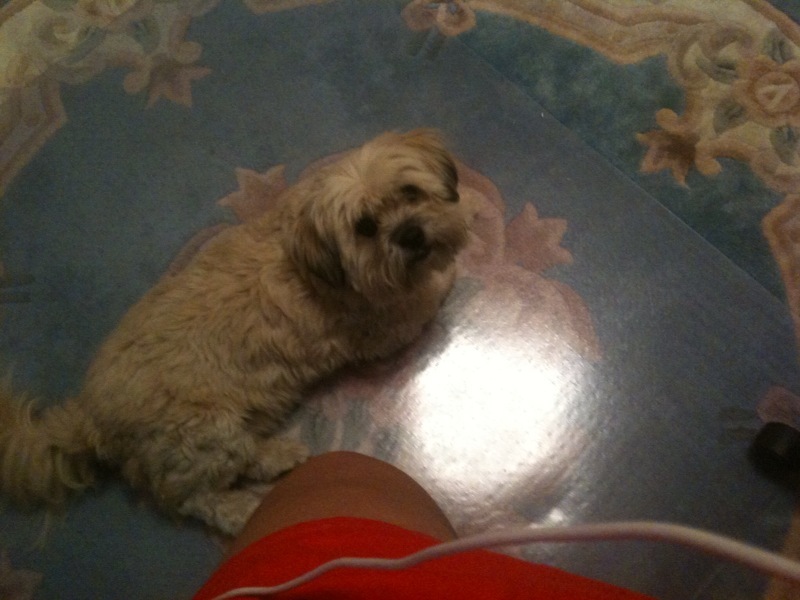 The Lhasa Apso (lha-sah ap-so) is a non-sporting dog breed originating in Tibet. It was bred as an interior sentinel in the Buddhist monasteries, who alerted the monks to any intruders who entered. Lhasa is the capital city of Tibet and apso is a word in the Tibetan language meaning "bearded," so Lhasa Apso simply means "long-haired Tibetan dog." 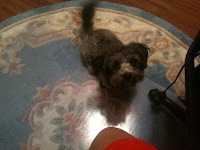 A one year old female Lhasa with short length hair and a slight underbite. 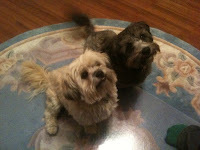 Male Lhasa Apsos should ideally be 10.75 inches at the withers and weigh about 14-18 pounds, 6–8 kg. The females are slightly smaller, and weigh between 12-14 pounds, 5–7 kg. The breed standard requires dark brown eyes and a black nose, although liver coloured lhasas have a brown nose. The texture of the coat is heavy, straight, hard, neither woolly nor silky, and very dense. Colors include white, golden, rust and parti-colored with various shadings. Lhasas can be with or without dark tips at the end of ears and beard. The tail should be carried well over the dog's back. The breed standard currently used by the American Kennel Club was approved on July 17, 1978. 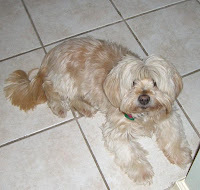 Lhasas can change color as they get older, starting with a dark brown coat which gradually turns lighter. A movement called the Tibetan Line Breeding Programme exists, to breed preseve the original Tibetan Lhasa Apso. This movement is based on the premise that after 60 years of Western breeding, the breed is losing key characteristics of their original Lhasa ancestors still living in Tibet and Bhutan. Do you ever wonder how perfumes and cologne got to be??? The word "perfume" is a derivative of the Latin word "parfumare" meaning "through smoke". Back in the olden times in Egypt, they used fumigations in honour of their gods. They sought wood aromatic, grasses, roots, etc... to create perfumes. They burnt the famous incense called Kyphi, a very odorous mixture composed of the myrrh, Matsic tree, bays of juniper, seeds of fenugreek, pistachio and edible shoveler duck, the whole crushed and mixed with wine and a preparation cooked containing resin and of honey. The Egyptians manufactured ointments, and essential oils for their religious practices and their personal uses. They applied them to their skin to fine cosmetics or therapeutic. The ointments were preserved in cups or mud out of alabaster. There were also small stone or ceramics bottles.One of the supreme pleasures of the Egyptian women was to place, on their head, of the small cones of greases and aromatic resins, which, while melting, scented their hair and their face. The Greeks continued the Egyptian practices with new reported fragrances their voyages. They coated the body of oils and ointments during the bath.The Greeks scented the body of their deaths and they buried them with personal objects of which a perfume bottle. The aryballes made it possible to spread the ointment on the skin. The Greek athletes coated the body with them before each test. 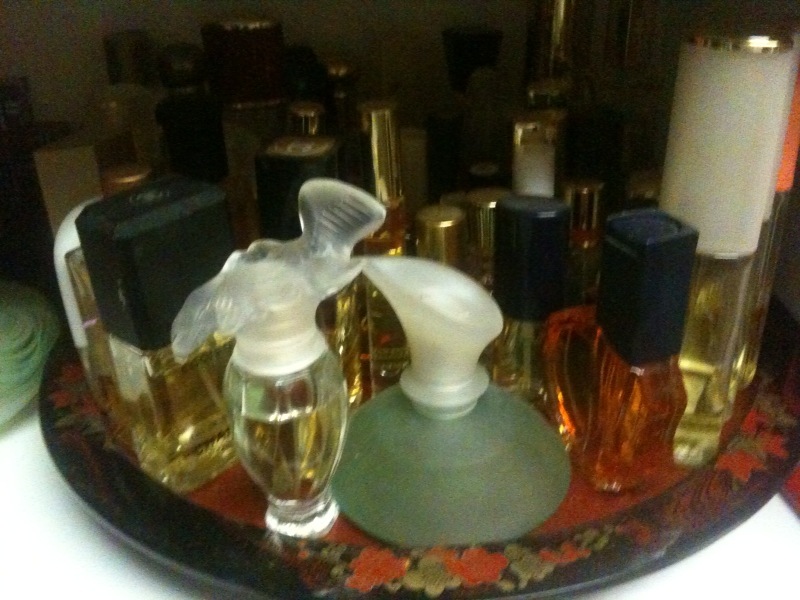 The Romans, in their turn, granted a great place to the perfume. They made improvements as for the ingredients and developed the use at the time of the religious, funerary rites of it and of the daily practices. The Greeks thought that the perfumes possessed medicinal virtues. They consumed some with excess going until sprinkling some on the walls and the grounds of their house. A great innovation was the use of the container out of glass. Even today, France remains the centre of the European perfume design and trade. Eau de Parfum (EdP), Parfum de Toilette (PdT): 10-20% (typical ~15%) aromatic compounds. Sometimes listed as "eau de perfume" or "millésime". Perfume oils are often diluted with a solvent, though this is not always the case, and its necessity is disputed. By far the most common solvent for perfume oil dilution is ethanol or a mixture of ethanol and water. Perfume oil can also be diluted by means of neutral-smelling oils such as fractionated coconut oil, or liquid waxes such as jojoba oil. The intensity and longevity of a perfume is based on the concentration, intensity and longevity of the aromatic compounds (natural essential oils / perfume oils) used: As the percentage of aromatic compounds increases, so does the intensity and longevity of the scent created. Different perfumeries or perfume houses assign different amounts of oils to each of their perfumes. Therefore, although the oil concentration of a perfume in Eau de Parfum (EdP) dilution will necessarily be higher than the same perfume in Eau de Toilette (EdT) from within the same range, the actual amounts can vary between perfume houses. An EdT from one house may be stronger than an EdP from another. Men's fragrances are rarely as EdP or perfume extracts. As well, women's fragrances are rarely sold in EdC concentrations. Although this gender specific naming trend is common for assigning fragrance concentrations, it does not directly have anything to do with whether a fragrance was intended for men or women. Proper preservation of perfumes involve keeping them away from sources of heat and storing them where they will not be exposed to light. An opened bottle will keep its aroma intact for several years, as long as it is well stored. However the presence of oxygen in the head space of the bottle and environmental factors will in the long run alter the smell of the fragrance. Perfumes are best preserved when kept in light-tight aluminum bottles or in their original packaging when not in use, and refrigerated to relatively low temperatures: between 3-7 degrees Celsius (37-45 degrees Fahrenheit). Although it is difficult to completely remove oxygen from the headspace of a stored flask of fragrance, opting for spray dispensers instead of rollers and "open" bottles will minimize oxygen exposure. Sprays also have the advantage of isolating fragrance inside a bottle and preventing it from mixing with dust, skin, and detritus, which would degrade and alter the quality of a perfume. So... what is your smell preference??? At some points in our lives ... we feel the "powerlessness" and we try to deal with this "lessness" in our own ways. Some of us get angry, some want to die, some get paralyzed, some get critical, some get righteous, some get philosophical, some get into superiority or inferiority, some come out fighting and some just feel beat up. When in this situation, we take on a role to act it out. This is when we get into the so-called ... KARPMAN DRAMA TRIANGLE. Wikipedia discusses the KARPMAN drama triangle as a psychological and social model of human interaction first described by Stephen Karpman, which has become widely used in psychology and psychotherapy. The drama triangle shows the dramatic roles that people act-out in daily life that are unstable, unsatisfactory, repeated, emotionally competitive, and generate misery and discomfort for both people, sooner or later. The switching that occurs between Persecutor - Rescuer - Victim - generates the drama and the painful feelings that occur when people have hidden agendas, secrets, and then manipulate for dysfunctional personal advantage. The unfortunate and sad thing is when we handle the"lessness" by calling it in another person, usually ... the partner or the significant other. It is so easy to see it when another person handles this "powerlessness" this way but so hard to catch ourselves doing it. It is so easy to point a finger at someone, usually, at the person that we love. As a good friend would say ...remember that when we point a finger at that person in front of us, the rest of the fingers in that hand are pointing at ourselves. BE HONEST TO YOURSELF and so you can set yourself free and thus the domino effect of setting free the people around you!!! I will meet her again someday!!! I was cleaning up my filing cabinet when I came across this copy of a post made by a member of the message board I belong. I liked it then when he posted it, and I still like it now so I am sharing it here... Since I am one of those chicks over 40. ...by Andy Rooney from CBS "60 Minutes"
This is for all of you girls 40 years and over ... and for the ones who are turning 40 and for those who are scared of moving into their 50 ... and 60's... And for guys who are scared of girls over 40!!! A woman over 40 will never wake you in the middle of the night to ask, "What are you thinking?" She does not care what you think. If a woman over 40 does not want to watch the game, she does not sit around whining about it. She does something else she wants to do. And it is usually something more interesting. A woman over 40 knows herself well enough to be assuming in who she is, what she is, what she wants and from whom. Few women past the age of 40 give a hoot what you might think about her or what she is doing. Women over 40 are dignified. They seldom have a screaming match with you at the opera or in the middle of an expensive restaurant. Of course, if you deserve it, they won't hesitate to shoot you, if they think they can get with it. Older women are generous with praise, often undeserving. They know what it's like to be unappreciated. A woman over 40 has the self-assurance to introduce you to her women friends. A younger woman with a man will often ignore even her best friend because she doesn't trust the guy with other women. Women over 40 couldn't care if you're attracted to her friends because she knows her friends won't betray her. A woman over 40 looks good wearing bright lipstick. This is not true of younger women. Once you get past wrinkle or two, a woman over 40 is far sexier than her younger counterpart. Yes, we praise women over 40 for a multitude of reasons. Unfortunately, it's not reciprocal. For every stunning, smart, well-coiffed hot woman of 40+, there is a bald, paunchy relic in yellow pants making a fool of himself to some 22-year-old waitress. 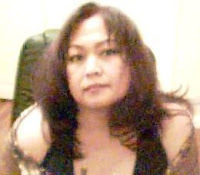 A westernized Filipina, single, a mother of one wonderful son and in the world of providing care for those that need my TLC. ...Westernized Filipina is someone that has adopted and has adapted to the Western world and yet retains the qualities that make a Filipina unique.